Science: Political poison ... or cure? 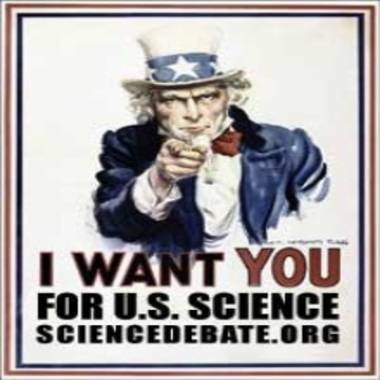 Uncle Sam's famous appeal gets a science-minded twist in this poster from Science Debate 2012. Some might argue that GOP hopeful Newt Gingrich blew his political chances by emphasizing big scientific ideas like the establishment of a moon colony — but what's really needed is more science, not less. That's the way Shawn Otto sees it, anyway. Otto, a filmmaker who was born and raised in Minnesota, is the co-founder of ScienceDebate.org and the author of "Fool Me Twice: Fighting the Assault on Science in America." He's also my guest tonight on "Virtually Speaking Science," a talk show about the scientific frontier that happens on BlogTalkRadio and in the Second Life virtual world. I hope you can join us at 9 p.m. ET (which is 6 p.m. PT and Second Life time), but if you can't, you can catch up with the podcast via BlogTalkRadio or iTunes. Even though Otto and his colleagues at ScienceDebate.org didn't get a full-bore, live-action presidential debate on science and technology issues during the 2008 campaign, they got the next best thing: A rundown from Barack Obama as well as his Republican rival for the presidency, John McCain, on 14 key issues. ScienceDebate is planning to reprise the "14 Questions" exercise this year, augmented by other questions from the general public. The organizers are even talking with TV networks again about having a broadcast science debate at some point during the presidential campaign. Shawn Lawrence Otto is an author, science advocate and filmmaker. Are people really interested in scientific perspectives when it comes to politics? Some studies suggest that increased scientific knowledge about political issues just confirms pre-existing cultural attitudes rather than changing anyone's mind. And there's experimental evidence that Gingrich's support in the Florida primary campaign went down dramatically last week after he highlighted the idea of creating a U.S. colony (and perhaps eventually the 51st state) on the moon by 2020. He ended up losing to Mitt Romney by a substantial margin in Tuesday's primary. "I don't think he handled it well," Otto said of Gingrich's moon moment. But Otto also said there should be room in a political campaign to debate big ideas — even the idea of going to the moon, Mars and beyond. "When have we gotten to a point where painting a big vision is seen as outside the mainstream?" he asked. Cosmic Log: How are science and technology issues being addressed this time around, as compared with 2008? Any big differences? Otto: Yeah, it's quite a bit different. Last time, because there was an open seat, we were getting to know candidates on both sides. Nobody knew for sure what their science positions were. We were trying to figure out where the candidates stood on a lot of these issues. There's also been the back-and-forth over the Keystone XL pipeline, and the fact that his administration has pretty much banished the words "climate change" and is only talking about green energy. And how he has cut back on NASA's plans, for instance. So there are some less than thrilling aspects from the science perspective, but he's much more of a known entity now. On the Republican side, particularly because of activism around climate change that's funded by energy industry money, and energy-industry-funded libertarian think tanks that are supporting Republican candidates in the primary process, there's been a lot of increased activism on the climate issue — and a lot of denial of the results of science. Also, ALEC has been suggesting that state legislatures should require schools to teach skepticism of evolution and climate change in science class. That appeals to the foot soldiers, largely on the right and in the Republican Party. It seems that whenever a candidate on the Republican side has been slipping in the polls, they've taken a vocal anti-science position to recapture some momentum. Which is the opposite of what you would have expected even 10 years ago. Whoever the winning candidate is on the Republican side is going to be interested in not appearing unreasonable or anti-science to the moderate, mainstream, middle-of-the-road swing voters once they get the party endorsement. So whoever gets the nomination is going to be anxious to moderate their views on science. Q: Right. You secure the base, and then you move to the center. A: Both Newt and Mitt have been very careful not to paint themselves too tightly into a corner — for instance, on climate change. Newt has said, very adroitly, that it "hasn't been fully proven." He's smart enough to know that nothing in science is ever fully proven. That is in fact a true statement. But most of his constituency may not realize that. So that's a careful nuancing on his part that I thought was quite clever. Mitt has gotten himself in trouble by his various recorded statements on the issue that seem to be contradictory. So I think Newt has handled it in a smarter way. But it's interesting to see what happened to Newt with the whole space theme last week. When have we gotten to a point where painting a big vision is seen as outside the mainstream? The big science issues are about the future. Certainly it's not a central plank in the campaign platform this time around, but it is worth talking about, I would think, especially in Florida. Q: It's similar to what happened when President George W. Bush announced the plan to return to the moon. It was easy to lampoon that, with the bumper stickers saying "Send Bush to Mars." I heard the same thing this time around ... "Send Newt to the moon." You could print the same bumper sticker. Was it a good thing that a scientific issue somehow captured the attention, or a bad thing because his stock went down as soon as he brought it up? A: I don't think he handled it well. I don't think his stock went down because of the subject matter, but more probably because of the emphasis that he placed on it relative to the other topics that the GOP base is concerned about — space and the moon or Mars is not high on the list when people are worried about the economy, or keeping jobs, or Social Security, or addressing housing foreclosures. If he emphasized it a little differently, I don't think it would have come out the way it did. Q: Do you think science and technology issues will play more of a part, or less of a part, compared with 2008? A: I think it's already clear that they're playing more of a part. The topic of science, and the denial of science, is much more of a politically charged issue. Unfortunately, science has come to be viewed as more of a partisan topic. I don't think that's right. I don't think that's healthy for America or the Republican Party. I'd like to see the Republicans get away from that, but it's part of the fabric, and people are much more keyed in on it. They're curious whether there are other areas where candidates don't see eye to eye with science. Q: You mean besides climate change and evolution? A: Wherever they pop up, whether it's HPV vaccine or other issues. Newt has said that embryonic stem cell research is killing children for research material. So it's getting a little extreme. Q: At one time you suggested that scientists should consider becoming Republicans. Is that still your counsel? A: Well, there are a couple of reasons there. One is that there are relatively few voters or activists involved in the grass roots of either of the political parties. So few, in fact, that if scientists actually did become heavily involved, for instance in the Republican Party, they could take over a lot of the process. There's a reasoned argument to be made that there's a leverage point there. Whether scientists would feel comfortable doing that is another matter entirely. I've had some long and interesting conversations with science writers and scientists about this question ... whether or not that's the way to do it, or whether the Republican Party will have to experience a time-out that's so painful that they'll change their anti-science, anti-reason, anti-intellectual ways. I don't know if that actually would happen. There's enough fervor fueling the constituencies in the Republican Party, and enough money supporting that fervor, that I'm not sure whether they'd abandon those views or just become more clever about marketing them. I think change has to happen from both within and without, as it usually does. Personally, I don't care what party scientists belong to. We just need their voice to be raised in our civic dialogue right now, more than we have in many decades.